Not to much to uodate. On May 1st the plant was one year old. The plant is growing well. Lower leaves have been removed and I'll see if I can't get it to bud low on the lowest branch. Fertilizer will remain 3-12-6 every time it's watered. I'll repot sometime this month into a 10 inch shallow oval. Here's the little guy with his growing buddy. The Ficus was taken as a cutting in Jan. before airlayering the mother plant to reduce the trunk. The Ficus took about 10 weeks to root and is about 8 inches tall. It's in a 4 inch pot and needs to be repoted soon. I'll give the little guy til july then put it in a deep pot over a rock and see what happens. Now I know what you mean when you say there wasn't much to update---sorry if I've 'rushed' you into this latest update. arboricola wrote: I'll give the little guy til july then put it in a deep pot over a rock and see what happens. I'd be very interested in seeing photos of the process used here (much like the step-by-step photo narrative you've provided with regards to the training undertaken with the older plant). 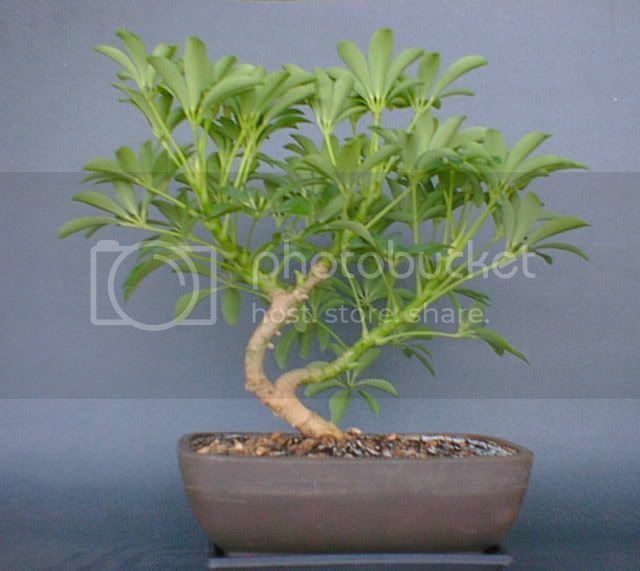 Speaking of the older plant...definitely looks like you've got some more fullness to that top growth---leaf stems appear to be relatively close together on those green branches. Is that about typical for what you'd expect at this point? 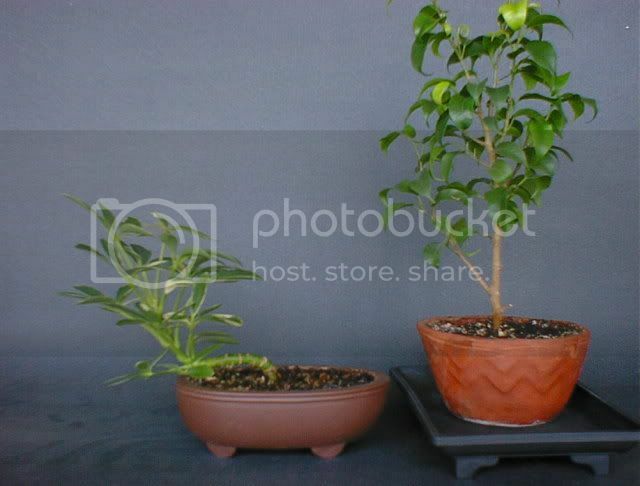 Tree: Ht: 11" Span: 15"
Pot: 10" unglazed Tokoname Ht" 2Ã‚Â¼" Pot size was determined using the span of the tree rather than the height. Fertilizer: Dyna-Gro 3-12-6 applied at Ã‚Â½ tsp. per gallon of water at each watering. Water: Distilled water applied every 2-3 days depending on condition of soil. 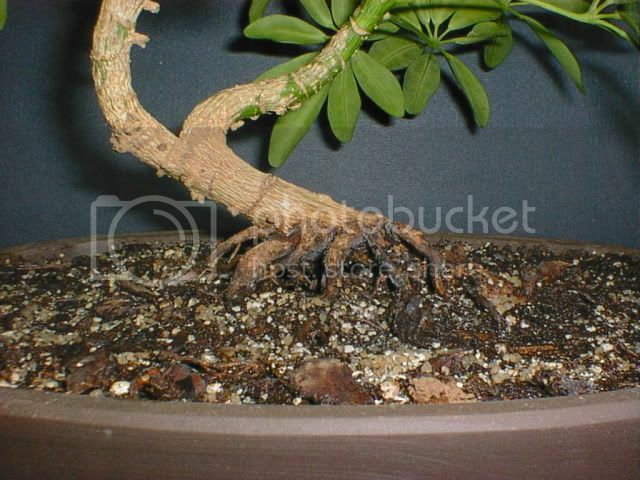 Plant was not mounted, but raised Ã‚Â½" in the new pot to expose the roots. It was repooted in an 8" pot over a rock. The pot was filled with soil, the rock set on top, and the roots of the tree planted in the soil. A few leaves were removed and the rest of the plant draped over the rock. A band of tin foil was put around the rock and filled with soil to cover. I'll give it 3-4 months before removing the soil over the rock. This will be done at Ã‚Â¼' per week. There's a 50/50 chance it might grow some roots over the rock. Questions and comments always welcome. I'm especially interested in seeing how the 'little guy' develops in its new root-over-rock potting arrangement. 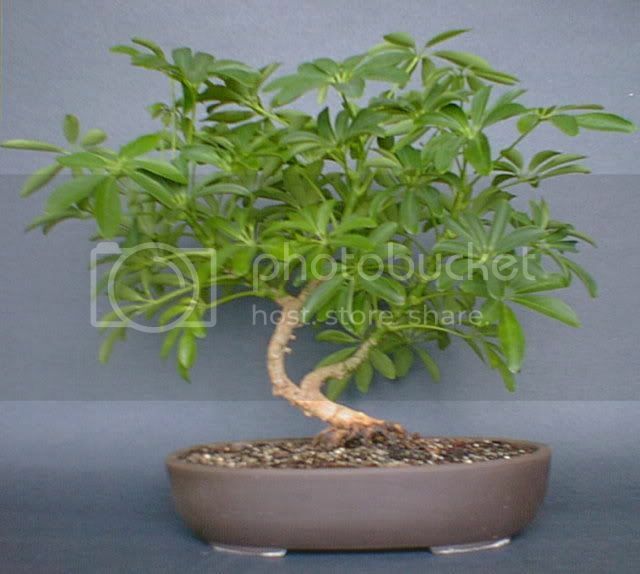 The instant bonsai was boxed up and sent to a plant loving friend in Missouri. She really liked the plant and I hope to get a photo to post in the future. The little guy didn't make it. It was my second attempt at a ROR using a variegated variety of schefflera. They just don't seem as hardy as the standard green. I'll give it another try when I can get a cutting from the big guy. 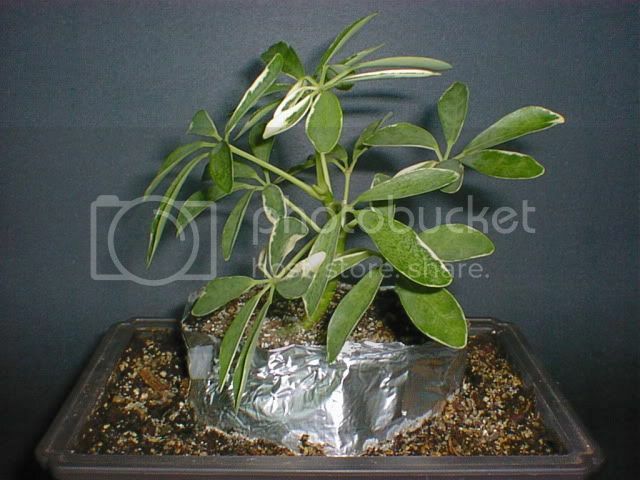 It was my second attempt at a ROR using a variegated variety of schefflera. They just don't seem as hardy as the standard green. I noticed a similar situation with a variegated Portulacaria I used to own. It was a much slower grower than the typical green variety. I have pretty much abandoned variegated varieties for this reason. These plants would likely be OK if you are lucky enough to acquire a larger specimen but growing them out seems to be an exceedingly slow process. For younger material I suspect it is better to stay with the 'green' varieties. Too bad about the loss, Phil. I've recently set up a root-over-rock planting using a variegated variety, and so far it seems to have somewhat established itself on the rock. It isn't thriving, but it isn't dying either. Will post updates in the future. Better luck with your next attempt! Wow your plant is beautiful! I just wanted to say that I've been following this thread for a while and I love how specific you are with the descriptions of what you're doing - it's extremely helpful for us beginners, and it's inspired me to give it a go with my own scheff =) Thank you for offering such a wonderful tutorial!